I was recently talking to a friend. She told me about how she had talked to her (fairly new) husband about her frustrations surrounding Christmas. Last year, they traveled to her sister’s house to enjoy Christmas Eve and Christmas Day. Soon after arriving at her sister’s home, her husband realized that he had totally forgotten her Christmas gifts at home. Since they had traveled a long distance to enjoy Christmas, he could not go back and get them. Many of you would say, “So? At least he bought her a gift!” But to my friend, it was a big deal. She felt hurt that he had forgotten to bring her gifts. How could he not care enough to put her gifts in the car? Did he not love her? She chalked it up to being newly married and assumed that her husband just needed a little coaching. Well, again this year, she experienced a similar frustration when her husband again disappointed her on Christmas. Although she had intentionally mentioned several items that she wanted, he instead chose to get her a set of headphones. Nice gift, right? Although it was a nice gift, he had not listened to her requests. One-on-one time or a thoughtful gift? Doing the dishes or a romantic evening out? A hug or a compliment? You will be surprised what you discover even if you have known a person for a long time. The challenge is that you may prefer to give love in a different way than your loved ones prefer to receive it! No matter what your love language, everyone wants to be loved, appreciated, and cared for! So if your special someone’s love language is receiving gifts (or even if it isn’t…better safe than sorry, right?! 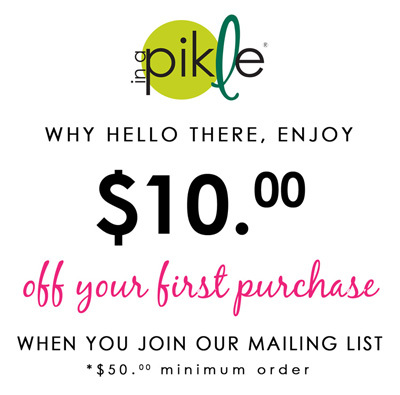 ), we’ve got a perfect gift idea …a Pikle! And through February 14, when you buy any complete Pikle (Pikle cover, interior pouches, wristlet, and Starter Pak), you’ll get a Pikle in “Think Pink” for FREE! Click here to shop.